As the world's leading designer of Apple Watch bands with black metal latching pins, we hold ourselves to a high standard. We've been collecting links from around the internet of people talking about our products, so that you can read them and make an informed purchasing decision. We invite you to learn more about ToneBands through these reviews and posts. 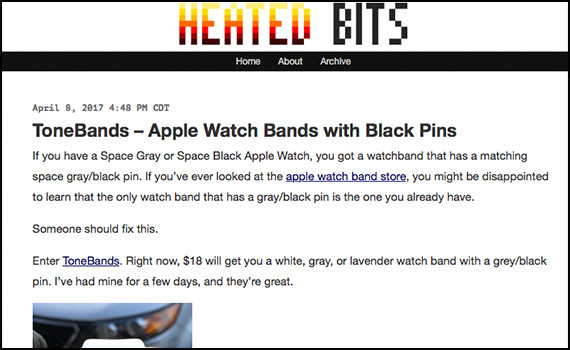 Macworld features ToneBands in it's "This Week in iOS Accessories" feature. Episode 184 of The Apple Watchcast Podcast talks about the release of ToneBands, and their happiness that someone finally tackled the black pin problem. Listen in around the 52 minute mark for our feature! Suicide_Run gives some photos and comments about his gray ToneBand, which is paired with a Nike+ Apple Watch Sport. Heated Bits offers quick impressions after a few days of wear. “If you’ve ever looked at the Apple Watch band store, you might be disappointed to learn that the only watch band that has a gray/black pin is the one you already have… Enter ToneBands… I’ve had mine for a few days, and they’re great. Reddit user Hermes13 posts a photo of his new ToneBand on a gold aluminum Apple Watch. A more detailed unboxing by dontFightThis offers insight in our first release's package design. Information about our launch release, covered by MacTech. AppleWorld.today is the first .today TLD to cover Tonebands!